Michael Fereday's review scored Jarte as a perfect "10". Jarte Plus contains all of the great features found in Jarte. Jarte Plus also includes the following bonus features for those who want to have it all! 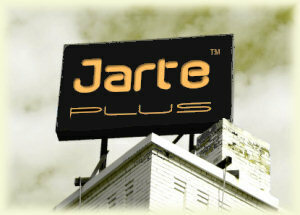 Jarte Plus can be purchased at the Jarte store. Jarte Plus includes a nicely formatted PDF manual which can be accessed from the Jarte Plus Help menu. The manual is very usable as a printed manual since it includes an index in the back, and page references are used throughout the manual to direct the reader between related topics. A printable PDF Quick Reference card that itemizes Jarte Plus' shortcut keys is also provided. Jarte Plus allows the creation of custom shortcut keys to Jarte's hundreds of commands. Jarte Plus' default shortcut keys may also be changed or deleted. The Quick Bar buttons are completely customizable in Jarte Plus. Jarte Plus supports scripting to automate frequently repeated tasks within Jarte by making it easy to assign AutoHotkey scripts to custom shortcut keys and custom Quick Bar buttons. Scripts can be used to automate template content as well. Jarte Plus can monitor your spelling as you type. When enabled, it will automatically flag misspelled words with a wavy, red underline. Right click on a misspelled word to access suggested spellings, ignore the misspelling, or add it to your custom spelling dictionary. Jarte Plus can automatically correct commonly misspelled words as you type. You can also add your own Auto Correct spellings to your custom spell check dictionary. Auto Correct can be especially useful when used to create abbreviations for words or phrases you type in often. For example, if you are a member of the Garden Writers Association and refer to that organization often, you could define the abbreviation "gwa" to be automatically corrected to "Garden Writers Association" whenever you type it. The result is faster, easier typing! Jarte Plus can automatically capitalize the first letter of each sentence as you type. This feature also automatically capitalizes each occurrence of the word "I". Auto Capitalize is yet another feature to make typing faster and easier. Jarte Plus' Split View Mode allows two documents to be displayed simultaneously either side-by-side or one over the other. Split view mode also allows a single document to be displayed in two independent views. This feature makes comparing two documents much easier. Jarte Plus' AutoOutline feature makes creating and editing complex outlines a breeze! AutoOutline automatically maintains proper number sequencing and styling throughout your outline as you edit it. The proper numbering style of each outline entry is determined by its indentation level. If an outline entry is added in the middle of an outline, or if an existing entry's indentation level is changed, all subsequent outline entries are automatically adjusted as needed. Jarte Plus' Project File feature helps organize, and provide quick access to, multiple files that are part of a single project. When Jarte Plus opens a project file it will automatically open the files pointed to by any file hyperlinks contained in the project file. For example, a project file would be useful to an author writing a new novel for which there are separate files for chapters, research notes, character profiles, etc. You have a special writing project and you want a specific set of files to automatically be opened whenever you open Jarte with the project personality. The project personality has its own favorite files list, default font, and clips list. More than one member of the family shares the same Windows login account and uses Jarte. Each family member can have their own Jarte personality that maintains their own favorite files, spelling dictionaries, background pattern, etc. Jarte Plus remembers your saved clips in the Clip List between Jarte sessions, as opposed to Jarte which forgets the saved clips when you exit the program. This feature can be used to store often used clips, remember scraps of information (e.g., web and e-mail addresses, notes, etc), save images and sounds, or even store small documents you don't want to bother to save to a file. The Reference Bar provides instant lookups to an online dictionary, thesaurus, encyclopedia, grammar aid, and quotes reference. Jarte Plus allows you to redefine those buttons and links. Jarte Plus also allows you to define up to eight additional links of your own. Your links can even be designed to perform keyword lookups just like the default dictionary, thesaurus, and encyclopedia buttons do! Jarte Plus allows you to attach a note to any document. You create the note in an independent editing window that allows you to enter any information you desire. Use this feature to store reference information, revision notes, reminders, and any other information about the document that you need to keep handy. Jarte Plus allows file hyperlinks to specify a "jump to" text target. When the file is opened via the hyperlink Jarte Plus will automatically scroll down to the first occurrence of the specified text target. Many people prefer the more professional appearance of the curly quotes in their documents. The feature that enables the use of curly quotes is called smart quotes because Jarte automatically determines whether the beginning curly quote or the finishing curly quote should be used when you press the quote key. Note: The Smart Quotes feature does not work with many non-English keyboards. Word count statistics are available in both Jarte and Jarte Plus via the Word Count button. In addition, Jarte Plus can display a continuously updated word count in the status bar. Jarte Plus allows you specify lower case Roman numeral page numbering in place of the normal Arabic page numbering in the header and footer lines of your printed documents. Roman numerals are often desirable when printing documents such as a preface. Carolina Road Software provides priority support to Jarte Plus customers. Order your copy of Jarte Plus today!